Members of the Laker women's tennis team take part in a previous leaf-raking day of service by hundreds of student-athletes on SUNY Oswego's 24 intercollegiate teams. 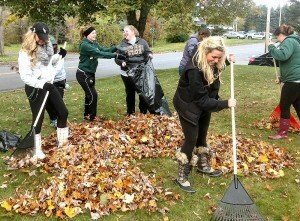 Student-athletes again plan to rake leaves for senior citizens within the city of Oswego on Nov. 9. OSWEGO — Hundreds of SUNY Oswego student-athletes are ready to rake leaves in the city of Oswego on Nov. 9, but they want to hear from senior citizens interested in this free help. Members of the Laker women’s tennis team take part in a previous leaf-raking day of service by hundreds of student-athletes on SUNY Oswego’s 24 intercollegiate teams. 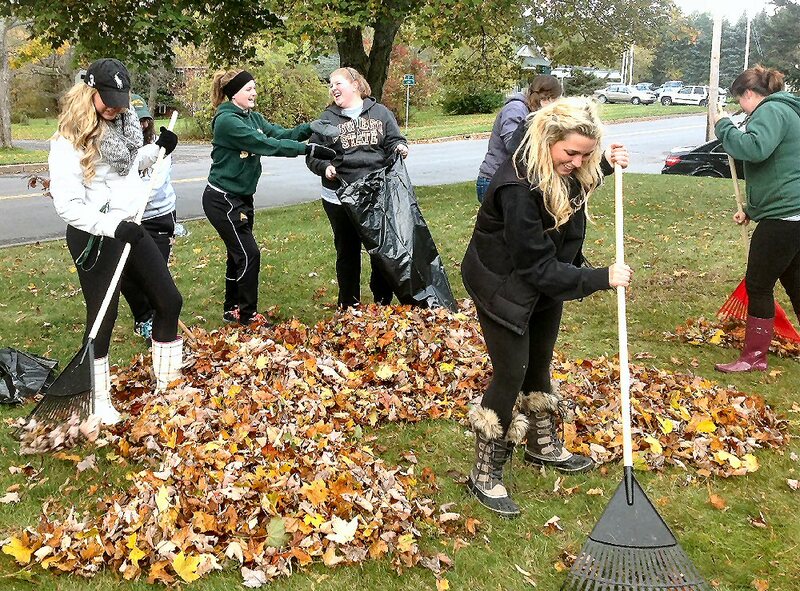 Student-athletes again plan to rake leaves for senior citizens within the city of Oswego on Nov. 9. In its 10th year at SUNY Oswego, the project is part of an annual statewide community-service project by Student-Athlete Advisory Council chapters at all 11 SUNY Athletic Conference colleges. “Our student-athletes appreciate the support all 24 of our teams receive from the community, so they enjoy this opportunity to give back,” said Diane Dillon, Oswego’s SAAC adviser and women’s ice hockey coach. Student-athletes will receive a list of yards that need raking and fan out to provide this service starting at 11 a.m. on Nov. 9. The project is limited to the first 50 yards registered and offered to seniors living in the city of Oswego. Homeowners must provide their own leaf or garbage bags. Supporters so far include Mark’s Pizzeria, which will help feed Laker student-athletes that day.